The first part of your invitation your guests will see is the envelope. Let it work hard to capture the awe of your recipient and make set the tone of your event before they even open the envelope. Most guests will cherish the entirety of the invitation as a keepsake, especially if it is personalized with bespoke calligraphy! Blush & Blue Designs specializes in many styles of calligraphy to fit your events unique look and feel. Please browse my portfolio of calligraphy details to get a feel for the styles we can work with. From brush lettering to modern calligraphy and traditional hands we can work our magic to ensure your guest's names look brilliant. Please note that envelope pricing begins at $3.50/envelope. This includes only the calligraphy services and not the purchase of envelopes (see envelope ordering below) Pricing is based on a standard A7 size envelope in either varying shades of white or ecru. However, we work with all shapes, sizes and colors of envelopes and inks, below is just a flavor of the offerings I can provide! Please contact me if you are interested in a calligraphy service estimate. *Investment prices are approximate and subject to change. For a more accurate estimate please use our contact page to discuss your envelope calligraphy project, or fill out the short form below. I would love to hear about your special event! **Wax sealing services may vary depending on complexity of design needed and total number of envelopes needing sealing. You will be mailed your custom wax sealer, stamps etc at your projects completion for you to cherish. I am happy to order envelopes for you to ensure the best possible quality for calligraphy, not all envelopes work well for dip and brush pens. However, If you do wish to supply your own envelopes that is perfectly OK as well! Please consult with me first on the brand you are purchasing as I may be able to help you pick out an envelope that will work best for the services you need. Envelopes will need to be shipped to me and include an overage of 15%, I will need to have extras on hand incase we have late additions to your guest list, and to test layout and ink flow. If I find upon receiving your envelopes that they are not a suitable quality for calligraphy we can discuss next steps. To ensure quick turn arounds I request that all guest lists be in electronic format, preferably in an excel or google spread sheet. Please be sure to include titles, last name, first name, children invited and any plus one invites (for inner envelopes only). It is customary that any single adults within the same household receive their own separate invite. Please be sure your guest list indicates households in some way. Changes to the guest list once your project has started may delay your delivery date and may incur a fee. Need help setting up your guest list? You can download my preferred wedding guest list template from google docs to assist you in creating your guest list. Complete with spreads to organize each side of the family so you can copy and paste on to the designated spreads for rehearsal dinner guest list, bachelorette and bachelor parties as well as the ceremony! 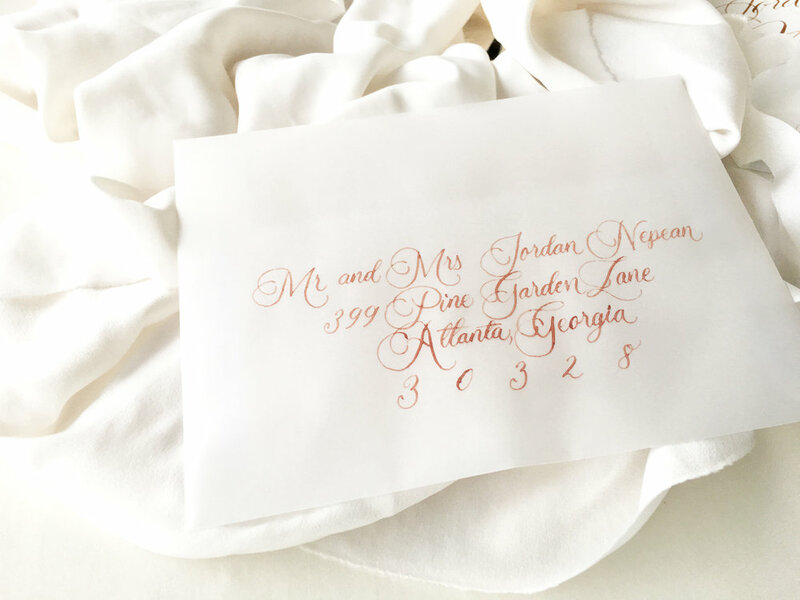 Request your customized envelope calligraphy quote below. Thank you! I will be in touch shortly with your customized quote.